Coffeeneuring is off to a grand start, with people near and far riding their bikes in pursuit of coffee (or related beverage). I can hardly keep up with it all. So much coffeeneuring! Don’t worry if you haven’t begun the challenge yet, you still have plenty of time to ride your bikes to 7 different cups of coffee. See the general rules here, and the uncondensed version here. Felkerino and I also coffeeneured both days. Our first stop was in the company of our friend Jerry and fellow coffeeneur John at one of our weekend favorites, The Coffee Bar. I also ventured out for a bonus round at Chinatown Coffee, and an in real life meetup with Jennifer and Lance, two Kansas coffeeneurs. They had just spent the bulk of the week cycling the GAP-C&O and were spending the weekend with D.C.-area friends. Unfortunately, we did not take a group photo because it was dark and drizzly, but it happened and it was great! I did manage a photo of my cup of hot chocolate and the beans I bought, though. Day 2 dawned as a dreary Sunday, cool and blustery. Coffeeneuring inspired us to face the elements, though not for too long. We rode five miles over to Baked & Wired for coffee and a treat, and agreed to tag on a loop around Hains Point just to let October know that we’re not scared of chillier weather. While there, we saw our friend MrTinDC, which was a nice surprise. 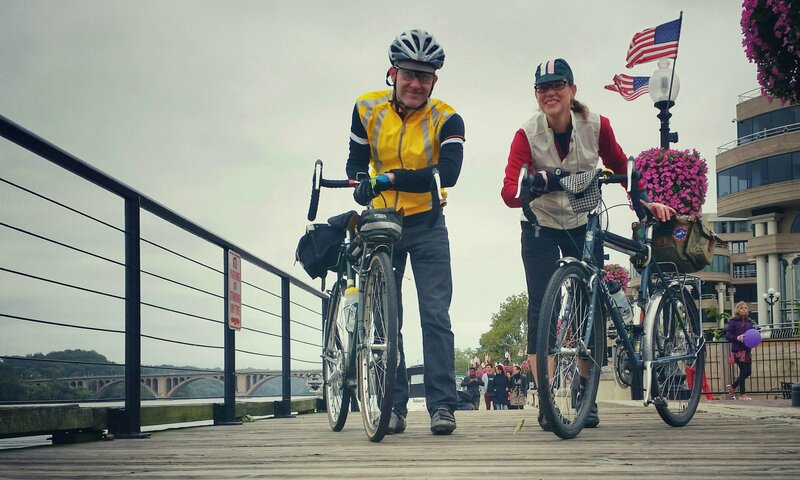 Felkerino has a full summary of Coffeeneuring Trip 1 and Trip 2, so please check them out. Special shout-out to the Pittsburgh coffeeneurs for coordinating a kickoff event at Thick Bikes, and for creating custom-made Coffeeneuring Challenge posters. Quite impressive! I hope to write an update of blogging coffeeneurs, but in the meantime be sure to check the Facebook Group, Flickr, and Twitter, for some of the updates. Coffeeneuring forever! So, er, which states do constitute the midwest? It’s still being debated, but there was controversy about the inclusion of Nebraska, Kansas, Missouri, and Michigan by various parties. I imagine there were some disparaging remarks about the current members of the Big-10 Conference, too. (Yes for MI, No for the other three – my two cents) But let’s get back to the coffee! Got my next one picked out already. Yes, someone suggested that original Big 10 teams = Midwest. But back to the coffee… that’s great. I’m still contemplating where my next stop will be. I grew up in Michigan and we always considered ourselves part of the midwest. MI is truly a Great Lakes state, but we graciously accept Midwest nomenclature as well.